As a kid, I spent hours drawing and sketching ideas that popped into my head. I used drawing as a primary language for capturing thoughts, exploring ideas, and then sharing those ideas. Teachers and mentors encouraged me, helping to sustain sketching as a key skill throughout school and into my professional career. Good fortune has ignited my passion to become a sketch advocate, helping others rediscover sketching as a powerful problem-solving and communication tool. When I suggest sketching as a visual thinking tool, I often I hear “I’m not an artist” or “I can’t draw.” While I understand the hesitation, I’m here to tell you that the artistic quality of your sketches is not the point. The real goal of sketching is functional. It’s about generating ideas, solving problems, and communicating ideas more effectively with others. When you feel inadequate in your sketching, pause and reconsider your perspective. Don’t worry how well you draw. Instead, think of your sketching as visual thinking, which works regardless of your drawing quality. Ugly gets the job done just fine. Fig 1. Keep it loose! Ugly sketches do the trick. There is no shortage of software or hardware tools for producing amazing work. It seems that whatever you can imagine, software and hardware can make it happen. 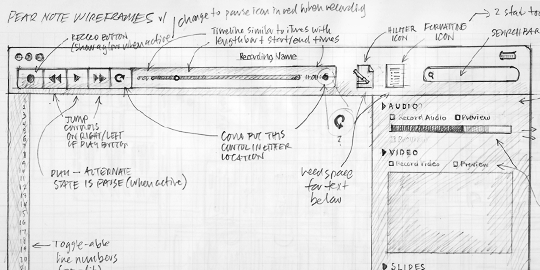 Adding sketching to the design process is a great way to amplify software and hardware tools. Sketching provides a unique space that can help you think differently, generate a variety of ideas quickly, explore alternatives with less risk, and encourage constructive discussions with colleagues and clients. Let’s explore these three benefits of sketching in more detail. Sketching is great for rapid idea generation. A pencil or a Sharpie and a piece of paper invite loose exploration. Remember to keep on generating ideas—you’ll want to push past that first bunch of surface ideas to get the deeper concepts out of your head. For quick idea generation, I like to read notes I wrote during the kickoff phase of a project, letting those words and thoughts rumble around my head until they lead me to new ideas. Once an idea comes to mind, I capture it on paper, add notes, and number each sketch as reference for later review. Fig 2. Sketching allows you to explore a wide variety of ideas all at once. The key to generating many ideas is to withhold judgment of them as good or bad until your sketching session is complete. First capture the ideas, letting them flow without worrying if they’re any good. Wait until you’re finished to judge and filter. Sketching offers you the freedom to explore alternative ideas. Early in a project it’s important to see a variety of different ideas so you can choose the best option. Sketching works well for this, as you can explore those varied ideas quickly. When you’re sketching, your mind is free to play and explore other directions that surface. Sketches help filter out “rabbit hole” ideas—concepts that are impossible to produce or impractical to deliver on. Drawing out ideas works as an early detection system—revealing potential issues before significant time is invested. Fig 3. Early in the process, it’s helpful to see if your alternative ideas make sense or if they are crazy. This is the time to ask “what if?” and explore the answers that pop into your head. Questions like “What if we could…” or “What if we were limited by…” can help break through the structures your mind forms around problems. Sketches have an amazing ability to foster discussions about ideas. With colleagues and especially clients, I’ve found sketches give everyone involved the permission to consider, talk about, and challenge the ideas they represent. After all, it’s just a sketch. Because sketches are unfinished and loose, they invite commentary. There is a latitude inherent in a sketch that seems to magically open the door for others to offer ideas—often thoughts you couldn’t come up with from your singular perspective. Fig 4. Sketches can help clients offer feedback because they are unfinished enough to spark discussion. When I’ve presented conceptual ideas in finished form, colleagues and clients often hesitate to be as honest as they are with sketches. There is something in tightly finished concept work that I think suggests significant effort was spent in production—leading colleagues and clients to hold back to avoid the additional work needed to make changes. Getting comfortable with sketching in your process requires repetition. Practice makes all the difference. If sketching feels unnatural to you, practice it a little bit every day. Find opportunities to doodle in the margins or, if you have them, draw with your kids. The more you practice, the more confident you will become when deadlines roll around. Here’s an idea to make practice happen: Carry a notebook and pen or pencil with you wherever you go. Check out the wide variety of Moleskines, Field Notes or Scout Books available and buy one. When you have downtime, take a few moments to sketch and loosen up or explore ideas you have about design challenges. Fig 5. Consider carrying a sketchbook and pen or pencil with you this week and see what ideas come to mind. The key here is to make sketching a routine, comfortable thing in your everyday life. You might be surprised at the ideas you’ll capture simply by carrying a sketchbook around. Give sketching a try for the idea generation and communication phases at the beginning of your next project. Remember, it’s not about the quality of the drawing, but about capturing and communicating ideas from one mind to another. Generate as many different ideas as you can. Explore crazy, way-out-there ideas and then see how your group or even your clients react. You might be surprised at the discussion that ensues. Because I’ve integrated sketches deeply into my design practice, I use them for concepting and sharing with my clients as a rule. From logos and icons to websites, illustrations, and UI design, sketches done early in the process are a key component. Here’s a sampling of projects where I used sketches to solve problems, generate concepts, and communicate ideas. This project was a re-design of the Heartland Funds website. Heartland Funds is a Milwaukee-based mutual fund firm. They wanted a site that matched their branding, was easy to manage, and felt welcoming. Fig 6. 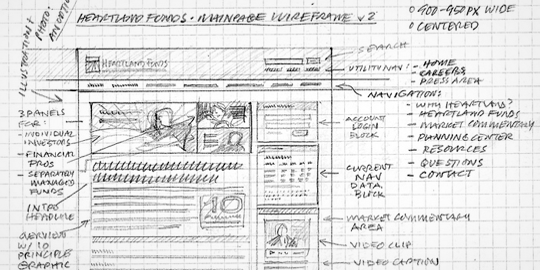 Heartland Funds home page wireframe sketch, with detailed notes in the margins for the client. The wireframes were well-received; a constructive discussion ensued about the details, which were later transferred to the visual mockups, the prototype, and finally, the redesign. For software developer Daniel Jalkut of Red Sweater Software, I was hired to create an identity that would capture the idea of his brand—simple, effective, and human software. Fig 7. Red Sweater Software logo concept sketches with detailed notes. 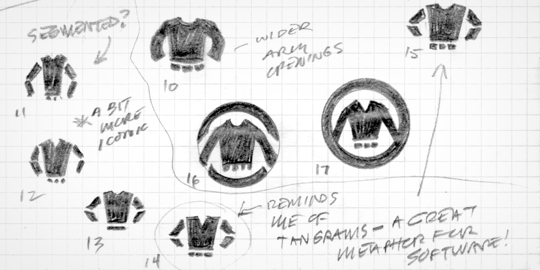 Daniel was pleased to see how sketching ideas helped accelerate finding the perfect sweater shape for the logo. Pear Note is a Mac application from Useful Fruit Software that records audio and video while you type. The original application was functional but needed better flow and a design touch. Using sketches, I was able to show developer Chad Sellers a variety of options for UI controls and structure before we moved to the visual mockup and prototyping stage. Fig 8. 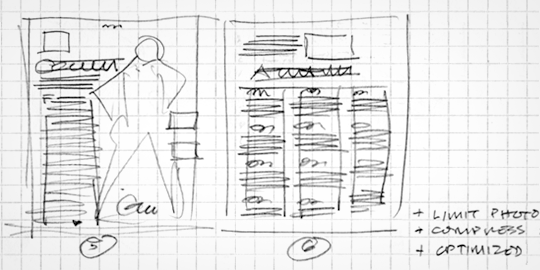 A pencil sketch with notes began the process of redesigning the Pear Note user interface. Sketches allowed me to visually capture and share my design ideas with Chad. Chad was happy with the final results and has found the redesign of the UI very helpful in bringing new users to his refreshed application. Sherman Dickman brought me in to create an icon for the Mac and Windows e-mail application, Postbox. Their software development team wasn’t sure what kind of icon would best represent the application, so they had me explore a wide range of ideas in pencil before choosing a US Postal Service-style corner mailbox. Fig 9. 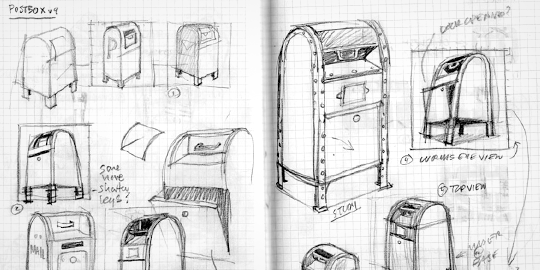 Various Postbox mailbox ideas were explored as sketches, long before building the icon with pixels. Creating sketches to explore many ideas (both good and bad) was very helpful to the Postbox team. If we had a crazy idea, it was relatively easy to sketch it out and see if the idea would hold up to scrutiny. Even the unusable ideas were helpful in that they helped narrow the field of winning ideas without nagging “what if” thoughts. 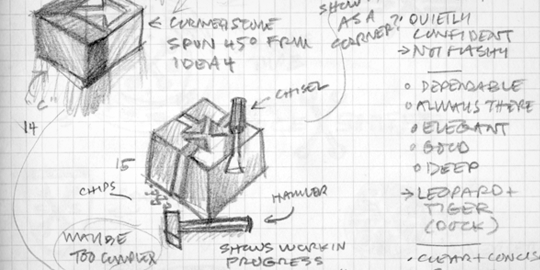 Whenever I talk sketching, the questions eventually turn toward tools I use and recommend. While I have my own personal favorites, I encourage you to explore and try new tools for yourself, until you find the best fit for your own needs. Pens: I’m a fan of all varieties of gel pens for my work—they cover well and dry relatively quickly. I like the Pilot G2, the Uniball 207 and most recently Uniball Vision and Pentel Energel NV. I prefer a wider 0.7mm tip for better ink flow and coverage. Markers: For markers I’ve been most pleased with Sharpie fine point permanent markers for quick concepts and have explored using Copic warm gray markers on wireframes—adding shading and depth to plain black lines with good results. Pencils: I prefer mechanical pencils in a softer lead like HB and B, because those leads help me to stay loose when sketching. My favorite pencil is the Faber-Castell eMotion with large 1.4mm leads for nice, loose lines. A thick pencil also lets me add rich solid lead very quickly. Paper: Paper can be personal and depends very much on the pen, pencil, or marker you plan to use with it. Generally I prefer smooth paper that has enough weight to keep sketches from showing through to the back of the sheet. I also tend to like graph and dot grid paper if I’m doing web and UI work to offer subtle structure, though plain paper works well for general sketching too. Books: Moleskine sketchbooks and notebooks are always a great choice for pencil and pen, though thinner paper in the notebook can bleed through on markers and some pens. For that reason I prefer the thicker sketchbook paper. I also like the Miquelrius graph softcover books, Behance Dot Grid books, Rhodia graph pads, and the more obscure Maruman Mnemosyne Imagination notebook from Japan, which features graph paper and a wonderfully smooth paper surface. The advantage of a book is that your sketches all stay together in a nice package for presentations, yet can be removed if needed. Spiral bound notebooks can lay flat on a table and allow for easy page removal, while hard or soft cover books are sturdier and probably better if you don’t plan to remove pages and are OK with the binding. Whiteboards: This is a great sketch surface that allows for easy erasure. The challenge here is to make sure you have fresh makers—dried out dry erase markers are no fun. Chalkboards: I had a recent experience with chalk sketching at the 37signals office. At first, the chalk and chalkboard surface felt strange, but I came to like the loose feel after working with them for a day. It’s a little messier than dry erase but also more tactile. iPad: I’ve found the iPad an interesting tool for sketching, especially with the advancement of software like Sketchbook Pro, Adobe Ideas, Penultimate and Draft, to name a few. I’m now using a Griffin Stylus for iPad and have found it pretty good for sketching. My fingers seem to work reasonably well for loose sketch work too. Why we Sketch by Jared Spool: Here’s a comprehensive overview of our motivations behind sketching, including thinking, hearing, documentation, and more. The Fear of Sketching by Yaron Schoen: Yaron talks about how he fell away from sketching to the point that he felt fearful of it and how he overcame those fears to begin sketching again. Pretty Sketchy by Jason Santa Maria: Jason talks about the importance of sketching for thinking—not artistic beauty. Jason also established a sketch group on Flickr which you can review and join to share your own sketches. To Sketch or Not to Sketch? by Erik Ford: Erik talks about how sketching expands his creativity and efficiency and has worked when he made it part of his routine. Sketch, Sketch, Sketch by Joshua Brewer: Joshua covers the benefits of drawing if you aren’t an artist, use of sharpies to keep loose, and the advantages sketching can bring to your problem solving processes. 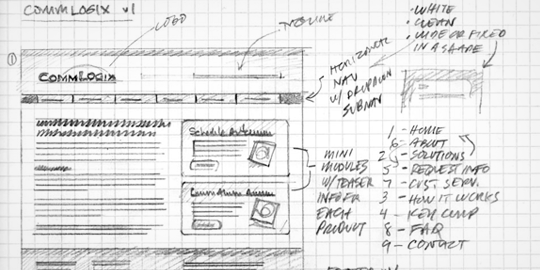 The Fine Art of Wireframes by T. Scott Stromberg: A how-to for using sketches as an IA tool, leading to better final wireframes and websites. Sketchboards: Discover Better + Faster UX Solutions by Brandon Schauer: A fascinating approach to consolidating sketched ideas and other elements onto a single large sheet of paper that can be transported for discussion and client meetings. 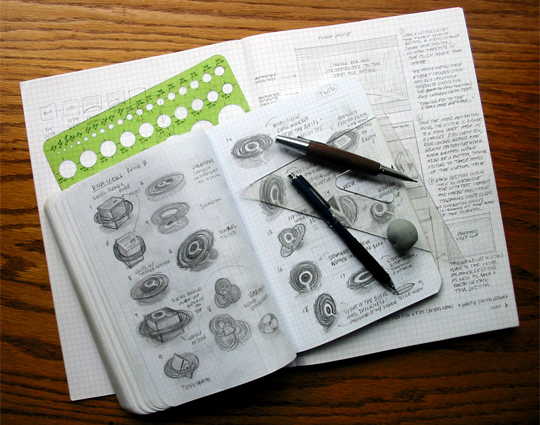 Our Favorite Tools for Sketching by Leah Buley: Tools used by the Adaptive Path team, all the way from thick and thin markers to cases and drafting dots. I hope to encourage and challenge you to take at least fifteen minutes on your next project to to sketch out ideas before investing time in design, development, writing, or code. See how it feels. Keep trying it until you feel comfortable sketching. Give yourself lots of grace if you haven’t drawn for a long time. This is a process, not magic. Tell that mean ol’ ghost of a teacher floating over your shoulder who scolds you for doodling that I gave you permission to sketch! Mike Rohde is a designer and sketchnote artist based in Milwaukee, WI. He is an experience designer focused on UI and visual design at Gomoll Research + Design, and runs Rohdesign Studios, a small design and illustration firm. Mike is the illustrator of REWORK, the best-selling business book from 37signals. Just wanted to say thank you Mike for a great article. I’ve always found sketching in the early stages of a project works best for me — and it’s also a lot of fun. And like most things, the more you do it, the better you get at it, as you pick up little tricks along the way. Thanks for sharing your sketches — they look great! You are very welcome @dpenny and thank you for your encouraging words! I’m very excited to share these ideas, because I know sketches can be so helpful for thinking and solving problems, regardless of their artistic quality. If this encouragement to sketch helps readers worried about their lack of art skills to give sketching a shot, I’ll be completely stoked. 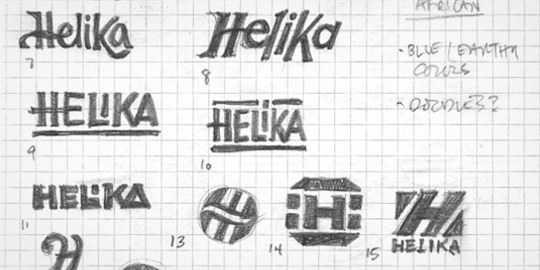 Much like yourself, I’ve loved sketching since I was a kid and I’ve found it an incredibly useful approach when starting a logo design or site layout. In fact my standard workflow begins on paper, long before I fire up photoshop / illustrator / whatever. Some of these sketches here are great! I totally agree that artistic ability isn’t a prerequisite to sketching out ideas. It’s great fun to knock out some ‘thumbnail’ ideas and then flesh out the good ones. I often come up with layouts that I perhaps wouldn’t have though of if I’d have gone straight to photoshop. On the flipside though, I’ve personally found that taking a little extra time out to learn some basic technical drawing methods (things like 3-point perspective) has really improved the quality of my work. I don’t mean to sound like I’m trying to scare anyone off, rather I find that if you try a sketching approach and it works out, it’s almost like a natural progression to take it further – Because it’s fun! @Kumori Media – right on with good references on learning to draw. A book I can suggest is called RapidViz, which is out of print now but available at Amazon. Super practical and helpful if you need a good, practical reference on improving skills. @Magellan – Thanks! I think the iPad is pretty good for rough sketching, but sometimes pen and paper is the winner for convenience and cost. Glad this article inspired you! @Vladimir – Thanks for the note. Maybe you can hire a printer to create books with your web template already printed into bound or spiral books. That could be very handy. I’m a project manager, with barely any drawing ability at all. But I’ve spend the couple years with a moleskine cahier extra large square ruled journal as my daily carry for meetings. I’ll have you know that Bob Dylan _is_ a great singer. Even better than Caruso. @jonathanpeterson – I’m pleased to hear you’re using sketching to suit your business needs. It’s encouraging to see you making use of pencils and notebooks to think visually with the drawing skills you do have – I suspect you communicate with drawings better than you may think! I completely resonate with the use of sketching as an imaginative tool. Even though my drawing ability is pretty poor, I still derive great value from trying my best to lay things out. Hey, would you consider sketching with a Wacom Tablet on Adobe Ps or AI same as sketching on paper? @kball – There are a variety of books out there for sketching technique, usually I suggest RapidViz as one for quick starts. Before buying books, why not drop by your local public library and look for books on drawing and sketching techniques first. Thank you so much for sharing your thoughts and ideas regarding your talent Mike. I am not good in drawing though I love to do so. I just get envy with my younger brother who is so artistic and love to draw and sketch anything that goes in his mind. I love this article because it encourage me to do what I really like plus a tip on how to do so. Your article will really help a lot of dreamers to draw and sketch more and to not give up. It was in grade school that I first did my first sketch of our favorite pet “Ringo”. He is a dog, but he looked like a dinosaur in my sketch. Since then, I never had confidence in sketching. But having been read this article, my interest in sketching is now coming back. Thanks to you! @padillamartin47 – Thanks for your kind words! I’m so glad to hear you are drawing, regardless of how you feel the quality is. As a thinking tool, this is the perfect way to approach sketching. Aas you do it, you’ll find your comfort level improving. Sometimes when I sketch, I use Pencil from the Pencil Project. It’s a good and opensource software for GUI prototyping. It’s developed for linux / win / mac when standalone and as firefox plugin. Was just having a discussion about neuroplasticity and the brain yesterday. If you don’t already sketch, taking it up encourages participation from parts of the brain you might not be tapping. Mike, your article has encouraged me to try to make it part of my workday processes. Some books also worth mentioning: Drawing on the Artist Within and Drawing on the Right Side of the Brain, by Betty Edwards. Also, The Back of the Napkin by Dan Roam. Non-artists like myself might also spend a little time looking up “gesture drawing.” The idea of gesture drawing helps loosen my tightly clenched grip on the pencil. If I can get myself to sketch consistently, I’m interested in observing how it might affect my thinking processes. … is what I keep saying for years. I don’t remember how many times I have been laughed at. I wouldn’t write “Carry a _notebook_ and pen or pencil with you wherever you go.”, but instead, “Carry a _sketchbook_ and pen or pencil with you wherever you go.” Well, you never know. Fully agree with what is being said. Nice piece of work including nice pieces of work. @NKjoep – Very interesting software/plugin – thanks for sharing! @RichardPosey – Really pleased you are going to give sketching a go and for sharing those book titles here. All of those book suggestions are great ones – Dan Roam’s is especially helpful for those who may feel drawing a tough thing to start doing. @Oliver B. – Thanks for the kind words. I think there are many who start projects with pencil sketches. I hope this article encourages even more to give sketching a try. Sketching is one part of the design process that is very fun and enjoyably, it allows you to be flexible and think outside the box (grid). Very importatn to get over the ” I cant draw” and just do it, there is no wrong or right when it comes to sketching when you are using the process to work through ideas on a project. I teach in a 2-yr Graphic Comm program. Sketching greatly improves both fluency and function in our work, regardless of the medium/a it’s intended for. We faculty walk uphill both ways getting students to spend enough time in sketching mode. Many want to leap into their Mac apps too soon. I find this an alarming disconnect — and outright fuddling — since they often claim to be “visual learners” and come to GC because the “graphic” part of GC attracts they way more than the “communications” part. I intend to share your article with all of our students in every class — also appreciate “further reading” suggestions. @foldingdummy Thanks for the note – I came from a 2 year tech college so it’s great to hear this article can help your students do more sketching up front. I think it’s a human thing to jump to what seems like the end point (computer) so we all need to remind ourselves to sketch first – I have to remind myself at times too! First up what a great article. You might be interested in knowing that in addition to all the benefits you mentioned sketching with a pencil (or pen), works well for another reason. When you write on paper you will engage more areas of your brain, example the motor cortex as we write and the Somatosensory system as we feel the pencil on paper. Unsurprisingly the more parts of your brain you engage the more interesting things get. Thanks, that was a good inspiration to kick me in a direction I had already been thinking of! One thing I did miss from the the article tough, was how sketches can aid coders. That’s something I’d like to see, a way to make a simple mock-up of a logic solution, which is what programming is about, but without going as far as UML diagrams or similar. Thank you for the article! Even though I’ve been a long-time sketcher, I don’t really care for concepting my design ideas in a book or all on one sheet. I feel like I’m wasting paper or running into myself too much if I draw too large, and not getting enough detail in if I draw too small! And I’ve got way too much stuff crammed into my purse for a sketchbook of any decent size; what if I have an idea when I’m out at a restaurant somewhere? Instead, I snip old printouts (making sure the backs are blank) into quarter sheets of paper. I keep a pile of quarter sheets at any desk I work at: home, work, drawing. I also keep some in my purse; in fact, a prerequisite of buying a purse/wallet for me now is that it can fit about 10 of them in a pocket somewhere. • They’re not bound, so I can draw all the way to the edge. • They’re easy to rearrange in a particular order, which works great for storyboarding out the flow of a site or animation sequence. • When you’ve got a set that’s related, you can paperclip it together for easy storage. • They’re thin, so they’re easy to trace over if you want to make a more detailed sketch of something. • Reusing things that would have been thrown away makes me feel greener, and cutting them makes me feel less wasteful (it also ensures I don’t mistake them for important documents floating around my desk that I shouldn’t be drawing on). I came upon this by a colleague. Even though paper will never go… i do like this. Mike, first of all great last name! I found your site due to an errant tweet of @mrohde but I’m glad I did. I’ve always avoided sketching because I’m not an artist but you make some compelling arguments to sketch to quickly get your ideas out on in a concrete form. I may take your suggest of carrying around a sketchpad to see if it helps me brain storm ideas and become a more visual thinker. Mike – Thanks to you and Sunni Brown for sharing your inspiring thoughts about using visual thinking to unleash our imaginations and problem solving. I just finished teaching an executive MBA course at UW-Milwaukee that focused a lot on visual thinking. We used Dan Roam’s Back of the Napkin as a text and I was very pleased to see my students take the risk to sketch their ideas and share them with others. We had fun exploring to web-based drawing tools – Dabbleboard and Simple Diagrams. Both tools helped us gain some confidence in our ability to use drawings to solve problems and think more visually. Thanks for sharing your work – I really loved your sketch notes in Rework! Keep up the great work. Coming back to my article after a little time has passed and am very pleased to see great comments here. @Mark – great point on brain engagement. There is something special about the mix of thinking and handwork that strengthens the ideas we process. @ritart – You are right! Everyone can do it. Whenever I talk with people about sketching, drawing or sketchnotes I encourage them to forget those old hang ups and just draw, however badly they feel they do it. The point is not the quality for art sake but rather, the quality of thinking it produces. @drlinux – Sketching for coders is a great idea for a new article. I have a good friend who does front-end development and he sketches on top of printed mockups as a way to process how he plans to execute his work. @delphina2k – Love the quarter sheets of paper idea. @Kortschot – Thanks, I have seen the Noteslate mentioned but haven’t tried one. Looks like a very interesting tool indeed. @MarcRohde – Hello fellow family member! Glad the article was inspirational – I hope experimenting with a sketchbook you carry around works well for your process. @drjuderathburn – It’s great to hear you applying visual thinking with students – providing some new tools they can use to solve problems as they make their way in the world. Happy to hear you enjoyed my REWORK illustrations! I really enjoyed the richness of your article. In reading it and seeing the illustrations it did remind of the Da Vinci exhibit and the value sketching was to bringing out his genius. It also reminded me that the value of sketching extends beyond design as a visualization tool for solving engineering and physics problems. Sketching with a Livescribe pen makes a great combination of the paper experience but digitized in an easy to follow manner. The pen can record the creation of the sketch so you can replay your ideas as you explain them by voice. And you can share directly from paper with the latest models. Been using one for a couple of years and it’s amazing.